I mentioned the other day in the post "Wins and Losses" that I think, or hope, that the future of advanced and professional digital photography will split sensibly between 1.5X APS-C sized sensors and the so-called "medium-format" sensors. 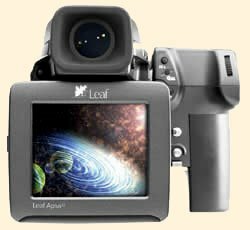 In view of the conversation that's developed since then, about digital black-and-white and digital dynamic range, it's worth mentioning that for the Leaf Aptus 75, which has a full-frame 36x48mm Dalsa CCD containing 39 MP (6,726 by 5,040 pixels), Leaf specifies a dynamic range of 12 stops. To get 12 stops of DR in traditional B&W requires significant contortions, and no slide film the world has ever known can get anywhere close. The Aptus 75 is able to capture a 16-bit file only 63mb in size (35mb using lossless compression), and features an ISO range from 50–800. Medium-format backs aren't part of the equation for many of us because they're so expensive. But just remember, it wasn't so very long ago (at least in Earth-years) that a 6-MP DSLR cost just as much as a Leaf back does today. Specifically look for the Richard Chang posts. The Aptus 75 is the aspirational back. As to what body and lens to use with it remains considerably less inspiring. yeah, maybe. But on the other hand it will pay a lifetime supply of traditional film with those prices. I'm not a digital luddite, but those prices aren't for most photographer's budgets. I'm pretty sure that the Phase One backs are all 12 stop 16 bit as well. Certainly the one I use stomps all over my dSLR in terms of catching the dynamic range. Yes, these things are expensive, but they are coming onto the market second hand. Phase also sell refurbs as they take backs in as people upgrade to yet more pixels. So if you can put up with only 16 mp these things don't cost much different from a Canon 1 series. The B&W digital back mentioned in the Luminous Landscape thread above has been around a while now but the company doesn't have a UK distributor. I'd love to talk to somebody who has used one. The computer stuck on the back looks clumsy. What does 'full-frame' refer to in this context? Late 80s, early 90s, shooting pro, billing $120K/year gross, film and processing fees ran at least $20K. Now that I don't shoot pro, film and processing is only a couple K per year. And that explains why some togs can buy the Aptus/Phase One and others do better with film and cheaper dslrs. I doubt the resolution will continue to go much higher as it is already overkill for most things - so hopefully competition will drive down price. I still can't get too excited about the camera options... The H2 or a hybrid mini view camera... yuk. "What does 'full-frame' refer to in this context?" Sorry, I let that slip past from the manufacturer's boilerplate. It means nothing, of course--just as it means nothing with every single other digital format. I don't want to belittle the progress being made with sensors, or Leaf's achievement with this device in any way (and I'd sure love to have one!). However the headline for the post refers to density range and there is something I just don't "get". You say that getting 12 f-stops of DR out of traditional B&W "requires significant contortions". All I can say is that I only once did an experiment to see how much detail I could get out of a traditional B&W night-shot with deep shadows and very bright street lights, spanning 14 f-stops overall. The answer: all of it - you could see the bulbs in the street light and clearly discernable detail in the shade. The contortion: stock-standard film processing, enlarged on multicontrast paper filtered for grade 00, no dodging or burning involved. I didn't like the look of it too much and chose to drop some detail for a more punchy contrast but in any case the detail was there. This was about 20 years ago, with Ilford HP5 (not "plus"). I doubt that any current digital camera could deliver that and I am sure there are films which can do much better, with new emulsions high-latitude processing and all that. Now I guess for most shots it doesn't really matter and I have no problem whatsoever with anyone who tells me that they prefer digital for any practical or aesthetical reason but I'm just getting a bit tired of being told at every corner of the way that now, finally, digital capture has objectively and measurably caught up with film (some people have been saying that since the first 6MP DSLR came out) when in fact it has not. Yet. I am sure that day will come, but not this year and probably not next year. Oh well, just my 3 Cents and probably letting off steam in the wrong place so take with a grain of salt. We tend to confuse the photographic sense of full-frame as a sensor of the same size that its counterpart in film with the electronic meaning of full-frame sensors. In a few words, they're meaning that a full-frame sensor will need a shutter against other kind of sensors like frame-transfer or interlined that doesn't. I'm looking forward to being in the future! Saving my dollars (well, kronor actually) for a digital back and just waiting for them to drop a bit. I consider myself lucky that my school has backs for loaning atm.